Working with TMD is always a pleasure. We can quickly and easily add products via our CMS, and the output of these products on the website clearly identifies to our customers our extensive range. I would have no hesitation recommending Trent and his team to any company needing a website. Dometic is a global leader in providing RV and Marine Comfort products, portable refrigeration, mobile kitchen equipment, electronic and automotive accessories such as reversing cameras, power inverters, chargers and in-car comfort products. TMD and Dometic Australia have enjoyed a long relationship – 8 years and counting. 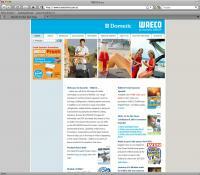 In that time we have built four websites: Waeco.com.au, Waeco.co.nz, www.getawaeco.com.au and dometic.asia. TMD Online has worked closely with locally based Dometic staff to produce sites that adhere to global branding guidelines, whilst still ensuring control of critical content can be modified in house. The Dometic sites are a wealth of information and our CMS has been critical to ensuring that visitors to the site leave with full knowledge of the Dometic product range, their technical specifications and the benefits of buying Dometic gear. We have also developed a dealers search function and dealer resources area, reporting and eCommerce options that help users find their closest dealer or buy factory seconds directly from Dometic.